Heat oven to 350°F. Spray 10-inch nonstick tart pan with removable bottom with CRISCO® Original No-Stick Cooking Spray. Place orange rolls in bottom of pan, spacing evenly; press rolls together to cover bottom of pan. Set icing aside. Brush 2 tablespoons preserves over rolls. Sprinkle 1/4 cup almonds over rolls. In large bowl, beat cream cheese, icing, vanilla and salt with electric mixer on medium speed until smooth. Beat in eggs, one at a time, scraping bowl occasionally, until smooth and creamy. Gently spoon filling over almonds on rolls, spreading to edge of pan and smoothing top. Cut up large fruit pieces in 1/4 cup preserves if necessary. Drop preserves in small spoonfuls randomly over filling. Swirl preserves into filling, using knife. 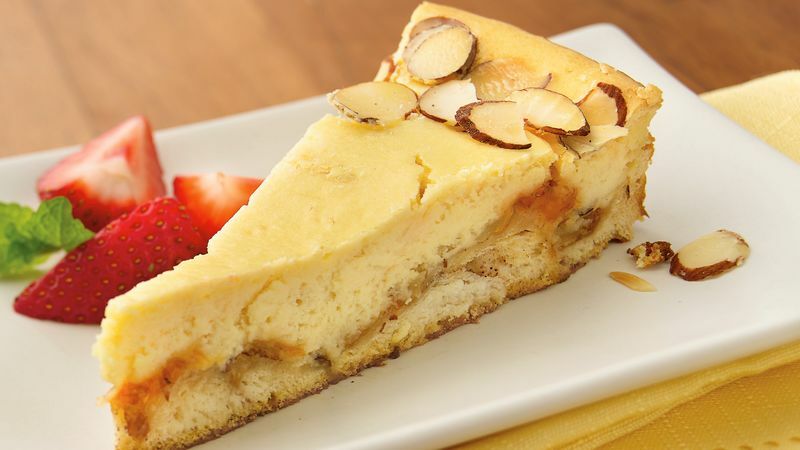 Sprinkle 1/4 cup almonds around edge of tart. Place pan on cookie sheet. Bake 35 to 40 minutes or until edge is golden brown and filling is set. Cool in pan 15 minutes. Remove side of pan; place tart on serving plate. * Refrigerate uncovered 1 hour 30 minutes or until chilled. To serve, cut tart into wedges, using sharp knife. Garnish serving plate with strawberries and mint leaves. Store covered in refrigerator. *Tart can be served warm if desired. Smucker’s is a trademark of The J.M. Smucker Company.